The following group types are not accepted by this hostel: High / Secondary School, Business Trip, Stag/Hen/Bachelor Party, Sports Group, Cultural Group If you have misrepresented the type of group you are booking for, your booking may be cancelled by the hostel." Built around a central patio, it offers a furnished terrace and a hammam. Free Wi-Fi is available in each en suite room at Riad Thaïs. The rooms are decorated with Tadelakt walls and they all have a view of the furnished patio. A continental breakfast is provided with and extra cost and it can be taken on the terrace. Moroccan dishes can be ordered for other meals, and served in the dining room featuring a fireplace. Check in: please contact the Riad to communicate your arrival time! My favourite riad in Marocco so far! 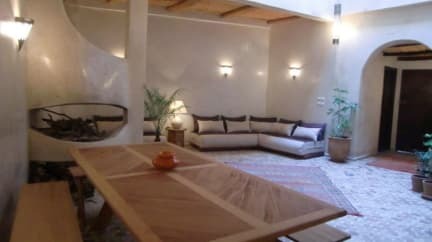 Situated right in the center of the medina, but still very calm, cozy and easy to find. The owners are so nice and welcoming! They renovated this house exceptionally beautiful, everything is perfectly clean and wonderfully decorated. It's a place to calm down, rest and enjoy the relaxed atmosphere of Essaouira. The price for the room is reasonable, the breakfast very good and the rooftop terrace is worth spending time on! We will definitely come back! Wir hatten eine super Zeit und ein fabelhaftes Frühstück. Sehr zum empfehlen ist auch die Dachterrasse. :-) Wir würden immer gerne wieder kommen! 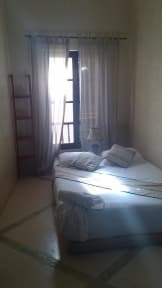 Riad Thais ist ein modern gestalteter Riad inmitten der Medina. Die Lage ist super. Man ist sofort in eine der Hauptgassen der Medina. Trotzdem ist es nachts ganz ruhig. Um die Ecke ist ein schöner dreieckiger Platz mit mehreren Restaurants, wo man lecker essen kann. Das Zimmer war sauber und jeden Tag gab es neue Handtücher. Das Frühstück in der Küche im Riadhof war reichhaltig und liebevoll gemacht, mit frisch gepresstem Orangensaft, selbst gemachten Pfannkuchen und Obstsalat oder Joghurt.